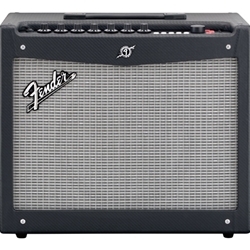 HIGH-SPEED, AMPED-UP AND LOUDThe new Fender Mustang amplifier series raises the standard for modern guitar versatility and muscle. Driven by incredibly authentic amp models and a huge bank of built-in effects, Mustang amplifiers come equipped with USB connectivity and Fender FUSE software, allowing your musical creativity and imagination to run wild. Mustang III is a 100-watt open-back combo with a 12" Celestion® speaker that sounds great and pumps serious volume. It contains 100 amp presets derived from 12 different amp models that deliver tones from vintage Fender sparkle to outrageous modern metal distortion, and 37 different effects in four categories (stomp, modulation, delay and reverb), all easily and instantly accessed. It’s great for rehearsing, jamming and small gigs, and the 1/8" headphone jack doubles as speaker-emulated line out. Further, connect Mustang III to your computer with free Fender FUSE software. Open up a world of possibilities, including on-screen parameter control, deep editing, additional effects, unlimited preset storage, online preset swapping with the Fender FUSE community, and free Fender artist presets. Mustang III’s included programmable two-button footswitch controls preset up/down, quick access, effects on/off and tap tempo (optional four-button footswitch also available). Mustang III packs it all into a striking visual design with sleek and modern Fender styling that provides a look that’s as desirable as the sound.